Members of our staff are CPR and First Aid certified. Amy Stanley is our Silverman Preschool Director. Amy took on the role of Director in 2014, but joined the teaching staff here at Silverman in 2010. Amy received her Bachelor’s in Theatre Arts from Towson University in Baltimore, and earned her Early Childhood Certification through Grossmont College and Cerro Coso College. Amy was born in San Diego, and moved to the East Coast as a child in 1989. She returned to San Diego in 2006 with her husband, and they welcomed their twins in 2009. Amy is thrilled to lead a team of such talented and nurturing teachers, and enjoys getting to know all of the children and their families as well! Amanda Shelton joined the Silverman staff in January of 2016. She had been a Silverman parent for a few years before she took on the role of Preschool Secretary, volunteering for a variety of different events and activities. Amanda attended the University of Washington where she met her husband Geoff. They moved to San Diego, where Geoff grew up, in 2002. They have a son and a daughter. In her free time she enjoys travelling and spending time exploring San Diego. Amanda is a tremendous asset to our staff and we are so grateful for all that she does! Laurel Bessler is one of our amazingly dedicated and delightful Preschool Secretaries. Laurel joined our staff in January of 2015, but she spent quite a few years being part of Silverman Preschool as a parent. Laurel has a BA in Human Development, and has a ton of experience in Human Resources and Administration. Laurel has a wonderful husband, Rob and two girls: one in first grade and the other in second grade. Laurel is a member of the Tifereth Israel Synagogue congregation, and she volunteers regularly to bake challah for Shabbat. Laurel is a treasure, and we are so happy to have her on our team! Polina Polyakov is our beloved and enthusiastic Pre-K teacher. Polina was born in the Ukraine, and moved to the United States in 1992. While in Russia, she earned her Master’s in Early Education from The University of Kiev, and since living in San Diego has completed a great number of courses at Grossmont College. Polina started working at Silverman in 1993, and has spent all of those years teaching the Pre-K class; she loves this age because of their curiosity, and eagerness to learn. She and her husband Michael have two daughters, as well as two grandchildren, one attends Silverman and the other is a Silverman graduate. Polina has a passion for teaching, and she motivates the children and parents with her vitality and excitement! Hanna Garner joined our team in the summer of 2018, working with our 4-year old children. She is continuing this year with our Pre-K class and she could not be more thrilled. She attended Pierce College for the majority of her early childhood education and continued through Saddleback College. She has worked with children, ages 2 – 6, for the past six years. She recently received her Associate Teachers Permit through the Department of Education. She loves being in the classroom and watching the children learn new skills and apply that knowledge in their lives! It is her goal as a teacher to make a positive impact on future generations. She is married to Jonathan, and they have two children named Ava and Gavin. They relocated from Ventura County to San Diego in the spring of 2018 and they are really enjoying their new home. Hanna is thrilled to be part of the Silverman team and is excited to get to know all of the children and their families. Elisia Scott joined our staff in the summer of 2017 as one of our Preschool teachers, and she currently works with our 3 year old class. She has lived in San Diego since 2005 and considers it her home. She is married and loves to enjoy all the diversity that San Diego has to offer. Elisia discovered her passion for early childhood while taking a child support course in school. She pursued her degree in Early Childhood Education in 2015 and is working on obtaining her Master Teacher Permit. In her free time she enjoys spending time with friends, visiting comic conventions, and playing games. Elisia is amazing with our Preschoolers and we are so happy to have her on our staff. Darren York joined the Silverman staff in 2015 as an Aide in the 2 year old and toddler classes. He is currently teaches our 3 year olds, instructing the older children of that group. He has completed all of courses towards becoming a Certified Preschool Teacher, and we are so proud of his hard work. Darren originally studied engineering at Grossmont College and San Diego State University, before following his heart into the world of early childhood. Darren enjoys comics and photography, and spends a lot of his free time with his wife, infant son, and four year old daughter at Disneyland. Darren brings a lot of great energy to the classroom, and he is a huge asset to our team. Amethyst Tagle-York Joined our school in 2014 as one of our 3 year old teachers. She has her Master’s in Education with a specialization in Teaching in a Global Context, as well as a Graduate Certificate in Early Childhood Education. Amethyst is currently attending Grossmont College and taking classes toward her Site Supervisor Permit. When she is not in school, she enjoys hanging out with her husband and their two children, going to Disneyland, reading books, playing the trumpet, and travelling. Amethyst has visited many exotic places including Shanghai, China, and San Jose, Costa Rica. She speaks Spanish, and hopes to learn a third language someday soon! We are so glad to have Amethyst as a part of our team! Candyce Sorenson joined our staff in June of 2017 as one of our Infant Aides, and currently works in one of our 3 year old classes. She was born and raised in San Diego and she enjoys all that our city has to offer. She is a proud mommy to two daughters; the oldest is five years old and the other is 20 months. She started working as a nanny after high school and fell in love with children. She began taking some Child Development Courses in the fall of 2017 and she is excited about earning her Early Childhood Certification. In her spare time she enjoys spending time with family and friends, and her newest hobby is kickboxing. Candyce is very sweet with our infants and parents, and we are so grateful that she is a part of our school. Jodi Argavani is one of our 3 year old teachers. Jodi worked at Silverman Preschool in the early 1990’s, before moving to Israel for almost 20 years. She returned to San Diego in 2018 and jumped right back in. She is happy to be rejoining us at Silverman. In Israel, she started an after school English program and taught for 15 years. Jodi enjoys spending time with her family, as well as reuniting with her mother and two sisters who she has missed terribly. Jodi studied early childhood development at Grossmont College and plans on incorporating Hebrew language daily with the children. Jodi has an amazing, loving personality and we are so happy to have her back. Sarah Phillips joined our staff in the winter of 2019 as an aide in one of the 3 year old classes. Sarah is currently attending Grossmont college, working toward her degree in both Early Childhood Education, as well as Liberal Studies.My name is Sarah Phillips. She hopes to transfer to San Diego State next year to continue her studies. She loves working with children, and watching them grow and change. During her free time she enjoys hanging out with friends, and spending time with her dog, Nala. She is most grateful to be in a field where she can grow and learn. She is thrilled to be a part of our staff and she is excited about this new opportunity. Larisa Borukhov is our dynamic and loving 2-year old teacher. Larisa was born in Uzbekistan, and moved to San Diego in 1991, with her husband and two daughters. Larisa studied in Russia, earning a degree from the School of Arts and Music, as well as her degree in Early Childhood from the Pedagogical Institute. Larisa studied singing and music as her specialty while living in Russia, and spent 10 years teaching music to preschool age children. Larisa has been at Silverman since 1993, and she has brought all of her musical expertise with her. Larisa incorporates music and singing into her classroom every day, and she has left an imprint on every child she has taught. Larisa has one grandson who attends Silverman Preschool. Larisa Shafran is our devoted and caring 2-year old Teacher. Larisa was born in the Ukraine, moved to Moldova, and later, ended up in Beer Sheva, Israel. Larisa earned her Associates of Art in Early Childhood Education from Calarasi Pedagogical College in Moldova, as well as a degree in Child Development in Israel. Larisa moved to San Diego in 2006, with her husband and her son. She went on to take additional Early Childhood classes at Grossmont College, and is still continuing her education through online courses. Larisa has been a part of the teaching staff at Silverman since 2006, and she offers a tremendous amount of artistic expertise, gentleness, and kind-hearted commitment to all of the children! Savannah Drover joined our Preschool in January of 2018 as an aide in the 2 year old classroom. She was born in San Diego, California, graduated from Steele Canyon High School in 2016, and currently attends Grossmont College where she is majoring in Child Development. She has always had a passion for young children and she hopes to one day be a Child Behavioral Specialist. She adores the children in her classroom and she loves to be part of their early learning. Savannah is very sweet and enthusiastic and we are so pleased to have her at Silverman. Ali Smith joined our staff in the summer of 2017 as one of our 3-4 year old teachers, and for the past year has worked with our younger 2 year old class. She has over 17 years of experience working with children between the ages of 0 – 12 years old and she studied Child Development at Palomar and Miramar colleges. Ali was born and raised in San Diego, and she is married with two boys of her own. During her free time she enjoys the outdoors; traveling, camping, and spending time with her family. We are so happy that Ali is a part of our staff. Laila Garcia joined our team in the Fall of 2018 as an assistant in our young 2 year old class. Laila recently moved to San Diego from Israel with her husband and son. They have been enjoying San Diego and getting to know their new home. She has a Bachelors in engineering from Sammy Shimon College in Beer Sheva City, but after having her son she decided to go into teaching. When she is not working, she enjoys cooking for her family and co-workers, as well as going horseback riding . Laila has a fantastic energy and we are so happy to have her on our staff. Sammi Sparks joined our team in the summer of 2018 working with our 3 year old class. She is taking on a permanent role as one of our toddler teachers this fall and she is very excited to work with this age group. Sammi attended Grossmont College where she earned her credentials to become a Preschool Teacher. She also plans to continue her education in the future. When she’s not in school, she enjoys going to the gym and spending time with her friends and family. Her personal philosophy is… if it includes coffee always count her in! Sammi has wonderful energy and we are so happy to have her on our team. Lauren Brown joined our staff in 2017 as one of our infant aides. Soon after she started working in our toddler class. Lauren is the youngest of five children and she has five nieces and nephews that she adores. She attended San Diego City College, and she is also a Certified Cosmetologist. She found that her true passion was working with young children, and surrounding herself with their energy brings great joy to her life. She will be continuing her education by taking Child Development Classes in the winter of 2018. Lauren is extremely happy to be a part of our staff and we are extremely happy to have her here. Shareea Eakins joined our staff in 2018 as one of our infant teachers. Shareea was born and raised in San Diego, specifically in Alpine and Jamul. She is one of ten children, seven girls and three boys, and she has a fraternal twin sister. She graduated from Steele Canyon High School and has been attending Cuyamaca College pursing her Associate’s degree in behavioral sciences. She is currently enrolled in Point Loma’s Child Development Program working on her Bachelor’s degree in Child Development. Shareea is very sweet and loving with our children and we are so happy to have her on our staff. Maley Kun joined our staff in the spring of 2017 as one of our infant teachers. She graduated from Herbert Hoover High School and went on to San Diego City College to study early childhood education. She has many years of experience working with children of all ages, and even spent some time doing an internship at Rosa Parks Elementary working with children with disabilities. The past seven years has been spent working with infants, and she simply adores the babies. She is the youngest of eight children and is a proud auntie to 14 nephews and nieces. Her hobbies are reading, hiking, cooking and exploring the outdoors. Maley is just wonderful with our youngest preschoolers and we are so lucky to have her on our staff. Kelsi Couch was born in Fullerton, Ca. and moved to San Diego in 2000 when her family was relocated to the area. She graduated from El Capitan high school and attended Grossmont College after graduation. Kelsi is the mother of two boys, ages five and two and has a passion for working with children. In addition to her work at the Preschool, she has a photography business and spends much of her free time booking photo shoots. Kelsi is absolutely wonderful with our infants and we are so grateful to have her on our staff. Jasmine Davis joined the Silverman team in the summer of 2018 as one of our infant teachers. She recently moved to San Diego from Bakersfield last year to continue teaching and to pursue her career goals of becoming a nurse. She has been working in a school setting for 10 years and in a preschool for 8 years. Within this last year she taught in her first infant class and fell in love with the babies. It is such an important time in their lives and it brings her such joy to be part of their development and growth. She already loves working here and feels that the staff and students are amazing. She is fantastic with our children and we are lucky to have her. Katie Edwards joined our staff in the fall of 2018, working in our infant class. She was born and raised in Sweetwater, Texas. Then she attended college at Oklahoma State University and graduated with a Bachelor in General Studies with an Emphasis in Human Development and Family Science. After graduation she worked at a Non-Profit Preschool in a two year old classroom, so she is thrilled to be working with the infant age group and can’t wait to bring her Texas charm and educational background to help the children and families grow. She has such a wonderful personality and we are so happy to have her on our staff. Bianca Morris joined our team in January of 2019 as one of our infant aides. Bianca is originally from Woodland Hills, CA and she moved to San Diego to attend San Diego State University. She graduated in December of 2018 with a Bachelor of Arts degree in Liberal Sciences, with a distinction in Psychology. Bianca worked with toddlers previously as a gymnastics teacher and she loved every second of it. She is excited to be working with the infants now and watching them grow. In her free time she loves to visit family in Los Angeles, and especially going to Disneyland as often as possible. We love having Bianca on our staff. 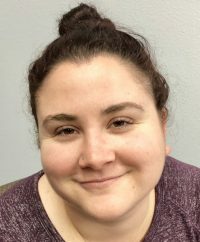 Vanessa Zukas Rowley joined our team in the winter of 2019 as a floater teacher. She currently attends Grossmont College, with a focus in child development. Her greatest passion is working with children, and she loves that she can get to know all different ages in her current position. In her free time she enjoys spending time with her husband and family, enjoying our beautiful city. Vanessa has such wonderful energy and is such a positive spirit in our school and we are so grateful to have her.